Dinner for when you have maybe too many (although I never think I have too many... just sometime I end up with a lot at once and that it can get a little chaotic) squash and tomatoes, which may be bound to happen this time of year. Nothing fancy, and is quick and easy, filling, and full of all those summertime things that need to be eaten before they are gone and we are back to eating beets and potatoes for months at a time. Savor all of the good stuff the summer is giving us. The stuff. A couple of squashed ( I used a crookneck and a patty pan), cherry tomatoes, an onion, some spaghetti, salt and pepper, and olive oil. 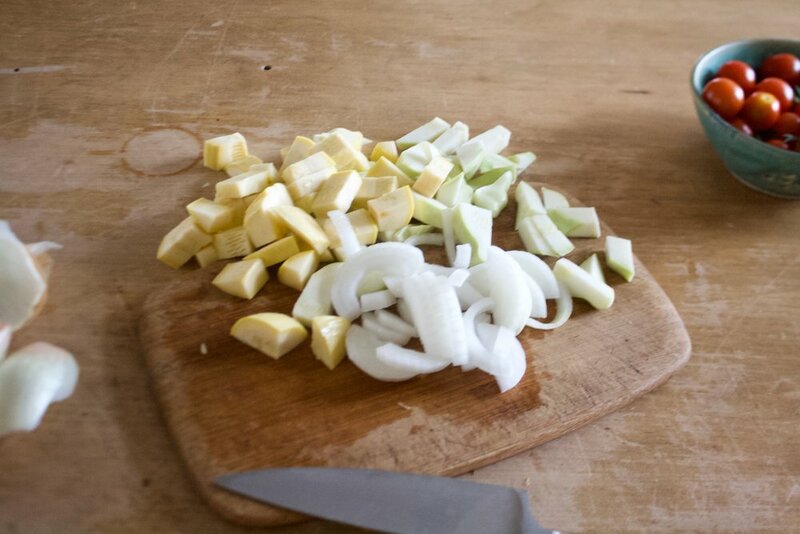 Preheat the oven and chop up your squash and onion. Not tiny pieces, but not really bug chinches either. Toss all that chopped stuff into a skillet along with the cherry tomatoes. Drizzle it all with olive oil, sprinkle with salt and pepper, then stick it into the hot oven. While the stuff is roasting, cook up the pasta, but cook it a little al dente, it will cook a bit more once mixed with the veggies. Roasted and ready for noodles. Add the cooked spaghetti to the skillet, along along with about 1/2 of cup of the pasta water (it helps bind the flavors all together). Toss it all around and then let it chill in the hot skillet for a minute or two then taste it. So good right? And if you need to, season with more salt and pepper, and drizzle with more oil if needed. That is all you need to do, besides you know, sticking it into a bowl, getting all the good big chunks, and eating it. Chop up squashes into inch-ish sized chunks then chop the onion into medium sized slices and toss into a large oven safe skillet. Add in the tomatoes and drizzle the whole lot with olive oil and sprinkle with salt and pepper and toss around to make sure everything is evenly coasted. Place in oven and roast for 30-40 minutes or until the squash and tomatoes are nice and soft and ready to eat. While the stuff is roasting, boil the pasta per the instructions on the box, but cook it a little al dente (still with a bite to it). Drain the pasta when done, reserving a cup full of the starchy pasta water. When the pasta is done and the veggies are roasted, dump the pasta into the skillet along with 1/2 a cup of the starchy pasta water. Mix around and let sit for a minute or two. Sprinkle with more salt and pepper and drizzle a tiny more olive oil on top (optional). Basil goes extremely well with this dish, if you just so happen to have some.